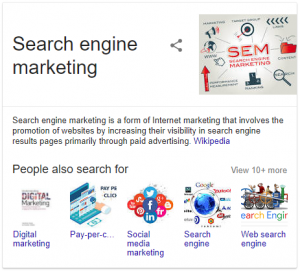 SEO professionals know there’s always something going on, whether it’s directly or indirectly related to search that needs to be considered for a SEO campaign. Here’s a look back at some of 2017’s highlights. Unsurprisingly, there’s a lot to talk about. In comparison to previous years, Google rolled out less than usual major algorithm updates. Volatility on the search engine results pages was kept to a minimum, with two of the major updates happening in the first quarter. In February a major update rolled out. Many of the positive and negative fluctuations in rankings were seen by webmasters around the 7th. It is suspected this was a content quality and spam related update (or multiple updates). March saw Fred arrive in town. 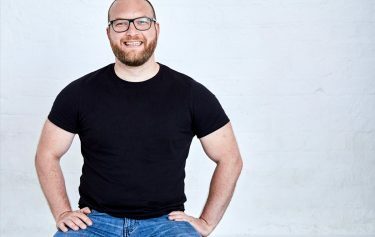 It is alleged that Fred came to fight websites that were prioritising monetisation over user experience. According to some industry experts, poor quality backlinks were also targeted. Adopting a secure protocol is something that Google has admitted will give a slight rankings boost. Users will find a secure site more trustworthy when entering their personal details. Something to watch out for is the various SSL certificates. Google distrusts certificates issued by Symantec and from March 2018, Google’s Chrome browser could alert users who attempt to visit a site with a certificate issued by Symantec or one of their subsidiary brands. Those who have migrated to secure sites will know it’s not always straightforward. A common issue we’re finding is internal links that still link to http pages from the https site. However, these can be highlighted using software such as SEM Rush and dealt with efficiently. There might be some hard graft involved, depending on how many of these issues arise. Searching the web using mobiles and tablets continues to be a growing device category amongst in our Google Analytics, with Google stating that most people are now searching on their smartphones. Mobile first indexing was announced in November 2016. However, this is something that has continued to cause a stir amongst SEO’s all throughout 2017. More recently on December 18th, Gary said this “We continue to be cautious with rolling out mobile-first indexing. We believe taking this slowly will help webmasters get their sites ready for mobile users, and because of that, we currently don’t have a timeline for when it’s going to be completed”. This should serve as a warning for those webmasters who are still far from being mobile ready. Start working on your mobile site now! Smart homes are no longer a thing of the future. Amazon Echo, Google Home, Siri, and Cortana are beginning to flood the market and have become popular because they can be connected to other smart pieces of kit such as Somfy’s TaHoma® and Sonos audio technology. It would seem, nobody wants to type anymore. Why not, when all you have to do is speak to the multiple devices surrounding you when you’re at home or out and about? This year saw a big shift in the way that content marketers write content. Instead of focusing on specific keyword combinations, the focus has been on creating content that ensures context and audience targeting. This is because Google’s content quality algorithms are advanced enough to understand user intent. 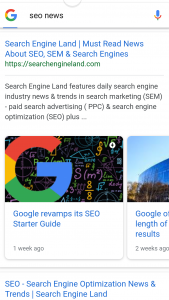 New content strategies have been formulated by content marketers that mix keyword research with newsworthy ideas, resulting in relaxed conversational styles of written content that just so happen to work better when using voice search. We’re now seeing more carousels dominating the top half of the search results. This can be seen both on desktop and mobile. However, they are appearing more when searching on your mobile device. Publishers that use accelerated mobile pages (AMP) are seeing a lot of their content in the ‘Top Stories’ carousels. 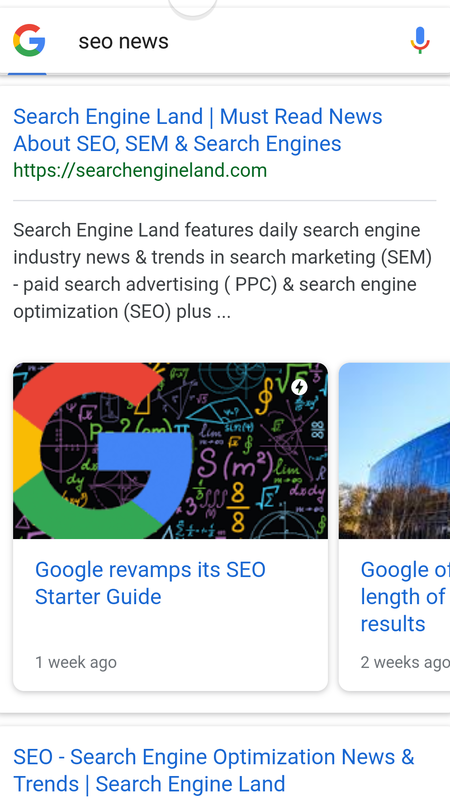 Publishers that currently don’t create AMP pages are starting to consider creating content in this format, because AMP pages are dominating the top half of the SERP’s, especially on mobile search. If you’re not using AMP, potentially you might see reduced click throughs on your content in the future, as a greater amount of webpages are created a Accelerated Mobile Pages. 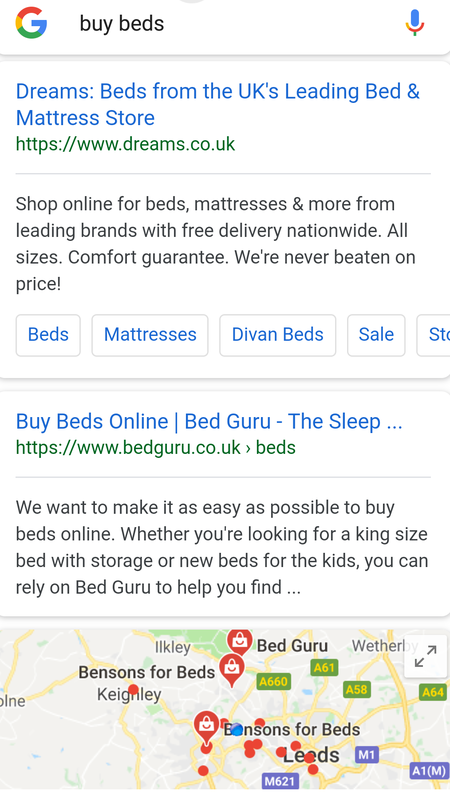 Google has also changed the design of sitelinks, which tend to show for branded queries. The new sitelinks now look like buttons, as opposed the previous text link style. If you’ve ever tried to optimise your website pages for featured snippets, you’ll know that they don’t always show as you would’ve expected, if at all. Featured snippets are still being shown in the SERP’s, but have been reduced by about 25% in 2017. Google seems to have been testing different Knowledge Graph panels and continues to do so. Definition results are something that aims to match user’s intent, as they deliver quick answers to specific questions. 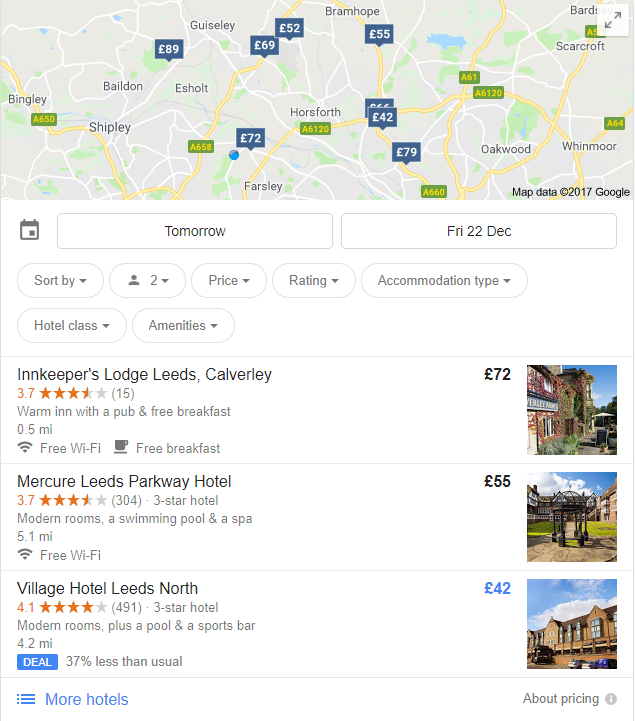 Like the quick answers that Google’s Knowledge Graph is serving up, you can now book hotels without leaving the SERP’s page. If you’re a hotelier, it is important that your hotel appears in these results. 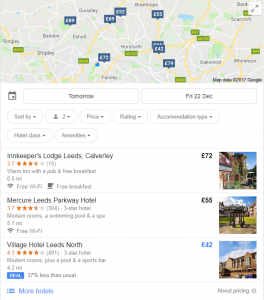 This can be accomplished by using Google Hotel Ads, or being listed with an online travel website such as Lastminute.com. With many users searching whilst on the go, there is a need for results that can predict things such as follow on questions, after an initial query. Because of this we have seen a surge in ‘people also ask’ questions, as an accordion style menu of related questions. You might even discover a question you hadn’t thought of asking. This is a result of Google’s ambition to become the worlds biggest knowledge base (if it isn’t already). Many tech companies, including Google, have started to fact check news articles that are published. Search engines strive to deliver the most relevant results and in the wake of the ‘fake news’ coverage that followed the 2016 US presidential election, content that isn’t trustworthy is now likely to be penalised. Google has teamed up with third party fact checking organisations to combat fake news. Unsupported and low-quality content has forced journalists and authors to take their citations and sources seriously, if they want to compete in search. Over the past few years there has been talk that some of the social media platforms such as Facebook may begin to take some of Google’s share of search. This isn’t the case. Social media platforms are incredibly popular, as we know, but Google continues to be the dominant force in search. 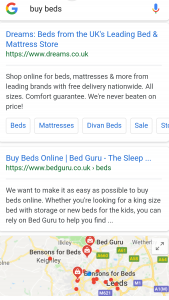 By prioritising mobile user experience, using carousels for products and AMP articles, Google has unsurprisingly kept up with the time and accommodated mobile users. Webmaster who optimises their sites for user experience are being rewarded, but many still forget that user experience goes beyond the desktop. To be head of the game is to be above the fold. 2018 is fast approaching. Do you have a forward-thinking SEO strategy? If not, contact Hub for a SEO audit and we’ll be happy to discuss a bespoke strategy with you. Our email address is [email protected] or alternatively, you can call 01132 396420. Which comes first, the product or the package?